Well sort of, as everything comes at a small cost. The cost of blackberry picking being a small amount of pain and suffering and that little thorn that is lodged in your thumb for weeks after. This year in the Adelaide Hills the blackberries have gone berserk, can only put it down to the good winter rains, surely it wasn't due to the early November heat wave followed by more rain, followed by late December heat wave, followed by January heat wave, followed by more high temperatures in February. But whatever the reason there is an abundance of large juicy fruit this year and like all things in the Hills this year they are about 3 weeks early, but the season will be longer than usual with many berries still ripening and even some flowers still to be seen. Let's hope that the next round of hot weather does not dry them up. 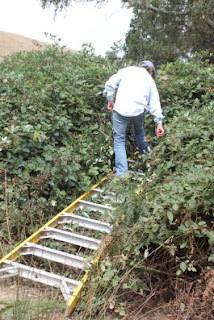 Blackberry pickers are inventive people. Below are some devices we are using to get to the best berries. 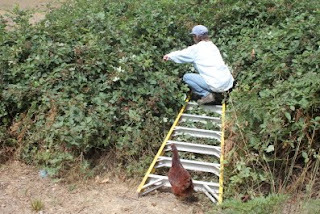 Step ladder for a little more height, long sturdy wire with hook at the end to bring forth that laden branch that is just out of reach, long ladder to plunge into the patch, passionate berry picker then climbs on and picks around themselves and contends with a chook wanting to join in. Also good picking buckets preferably with string attached to tie around one's neck giving the picker 2 hands free to pick and fend off those nasty branches that insist on attaching themselves to you. 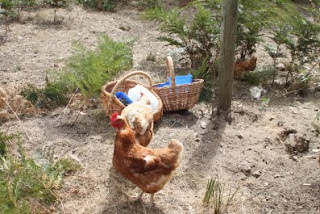 It is also a good idea to have containers ready to empty your buckets into and they definately need lids, otherwise the chooks will think all your hard work was for their benefit. There is only one rule in our blackberry patch - if you fall in, you must pick all the good ones around you before being rescued. What to do with all these berries? We and friends have picked about 30kg in the past 3 weeks, with enough jam in the pantry from previous seasons, this year we decided to freeze the very best berries for topping up breakfast fruit bowls and putting into muffins, trifles and ice cream throughout the coming year. We have 4.5kg for this purpose and think that should do. We freeze them on trays then put into containers so they do not stick together giving you the option of taking just a handful at a time. 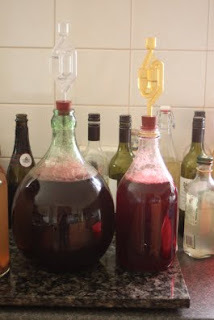 With the rest we have decided to try our hand at some wine, we have 9kg so far in the freezer to make plum and blackberry wine (I have been told that it can taste like a good shiraz), the plums are still ripening and we should end up with about 10 kg but we wish we had more. We have also made 2 batches of blackberry wine. Wash blackberries, peel lemon thinly and put both into a large bowl. Pour over the boiling water. Cover and let this stand for 3 days, stirring daily. Strain through muslin on to the sugar and stir well. Add the lemon juice and previously activated yeast. Leave for 24 hours in a warm place, then pour into the fermentation jar and insert an airlock. Leave to ferment to a finish. Syphon off and bottle. I have now started picking the good ones for my parents who love to make blackberry pies all year, and our blackberry picking friends new and old will be back for more over the next few weeks. Throughout blackberry season there are always some city folk picking on the roadsides around the hills. I haven't seen any this year yet, but they have been spotted by a berry friend this week. 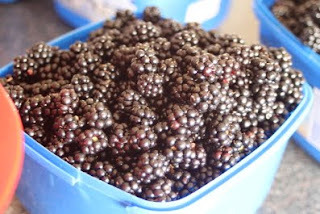 A word of warning to the roadside pickers beware of blackberries that have been sprayed. If they have been sprayed awhile ago they will have dead foliage so easy to spot. If they have only been sprayed recently they may still look lush and have tempting berries but they will have a kerosene type smell and taste about them so avoid at all costs. I feel like I have been picking blackberries for most of my life but never tire of the abundance that can be had from your own patch that does not require very much work during the year (we give ours a cut back every few years just to keep it under control). In my late teens my father kept a very nice controlled patch that was always abundant. If he ever saw people picking on the roadside (where the plants had been sprayed) he invited them in to pick ours. I will never forget the sight of the 3 nuns in full white habits picking our berries. Wow - life will be good at the gnomes' home this year with blackberry muffins and plum and blackberry wine by the winter fireside. We enjoyed your blackberries with morning oats, mixed with almonds, sultanas, peaches, grapes and mulberries. Next year we can supply plums in exchange for berries, if Satsuma plums are a suitable variety. Andrew, if the plum & blackberry wine is a success we will definitely take you up on your offer to swap plums for berries or whatever else is in abundance. I don't think it matters what type of plum, the more varieties the better...maybe. Here's to a wine tasting session somewhere down the track. Berry good post and berry delicious things being made at Berriville!